The average cost of 60-minute online American Sign Language lessons is $51. While the exact cost will vary depending on the teacher, type of lesson, and your location, you should expect to spend anywhere between $25 and $150 per hour. For the best experience, we typically recommend 60-minute online American Sign Language lessons. However, students looking for a more affordable option may want to consider a shorter lesson length of 45 or 30 minutes. On average, 45-minute online American Sign Language lessons are 24% less expensive at $39, and 30-minute lessons cost 44% less at $29. Curious how much online American Sign Language lessons cost in your area? Do a quick search to get local prices for the best online American Sign Language teachers . and taught me so much. I now sign at church, majoring in American Sign Language in college and just completed my first ASL class with an A from a tough professor. I wouldn't be where I am today if it wasn't for Eddie. He is the best and I highly recommend him!! He is an awesome teacher!!" and takes the time to answer questions if something doesn't makes sense. She is so sweet and kind, and I would recommend any classes with her." I decided to give it a shot. Absolutely glad that I stayed in the online class! It was a very entertaining experience and in just 45 minutes, I already learned a couple signs! Thanks, Victoria!" "Tony's heart and skill level cannot be matched. I recommend him without reservation!" Houston, TX teacher: Tony S.
"I am getting more confident with her classes. Shes a very patient teacher as well!" eginning my online classes with Eduardo. I was signing around an intermediate level but I still had difficulty with expanding my ASL vocabulary, signing in ASL word order, appropriate use of facial expressions and being comfortable and confident with my signing. Eduardo has helped me in all of these areas. He is a patient and encouraging teacher but also knows how to challenge and help his students achieve their best! Eduardo is also great at individualizing and tailoring the lessons to meet his students' specific needs. For example, I have always want to to improve my signing so that one day I could be a psychologist who works with individuals in the Deaf community. Eduardo has tailored my lessons to help me learn new medical/psychology terminology in ASL. He also teaches me by guiding me through mock mental health/counseling sessions so that I can practice and get a feel for what it may be like to sign and converse with a Deaf patient. My signing has definitely improved with Eduardo's instruction. I highly recommend Eduardo!" "She is so fluent! She also tailors the leason to you." 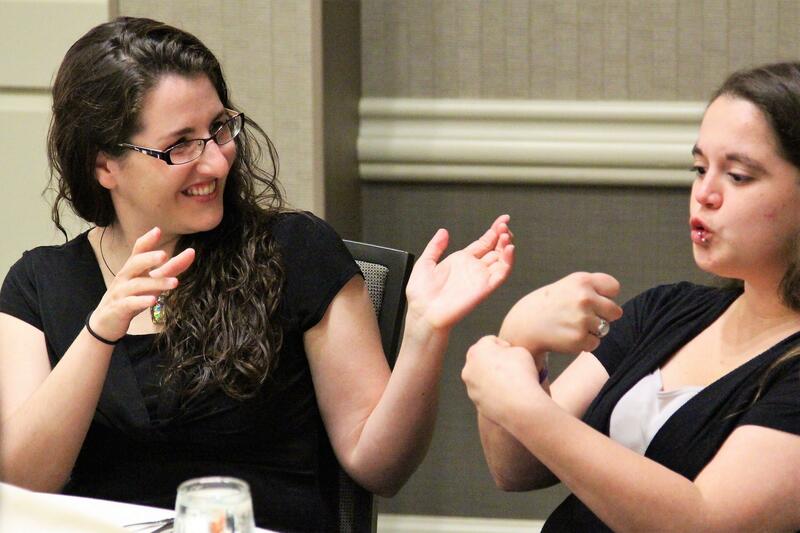 I am a Deaf fluent communicator, instructor, and performer in ASL. I founded Loud n Clear Musik to teach music and sign language to both the hearing and the Deaf world. ASL lessons can also be taken for art, music, and ministry purposes. My lessons are for students of all kinds to help them better communicate, understand, and connect with the Deaf friends, families, community, customers & clients, and peers. I communicate in ASL non-stop with all Deaf, Hard of Hearing, and Deaf-Blind. I can teach you ASL effectively, fitting your level with ease, and with lots of fun!! I also communicate (and speak) very well in two other languages: English and Spanish. I can teach individually or teach a class. I just started working with Eduardo about a month ago - he is a fantastic instructor! I can’t imagine learning ASL from anyone else. I am dedicated to teaching American Sign Language (ASL) to anyone who would like to learn this beautiful language but has never known where to start. I offer a variety of services to help you in your language journey such as one on one private lessons thru SKYPE, tutoring and Baby Signing Time classes. Do you want to learn the American Sign Language online? If yes, then you’ve come to the right place. Private American Sign Language lessons and classes with a TakeLessons Certified™ tutor - whether in-home, studio, or online - accelerates your progress, increases enjoyment, and improves every beginner's chances of becoming an expert player. It's easy, it's affordable, and it works. Our ASL teachers work with students of all ages: kids, teenagers, adults, and even seniors. Your teacher covers all aspects of ASL, such as the alphabet signs, the vocabulary, the grammar, the sentence structure, the geographical variations, and more. They can offer you advanced techniques and tips, and help you develop good practice habits, in order to maximize your learning experience, and achieve your goals faster. Students taking online classes can learn at their own convenience, enjoy better rates, and choose from a wider selection of ASL teachers nationwide. If you've ever taken language classes over Skype, you'll enjoy using our interactive TakeLessons Classroom.